*Promotion is for US customers only and not applicable to distributors or resellers. 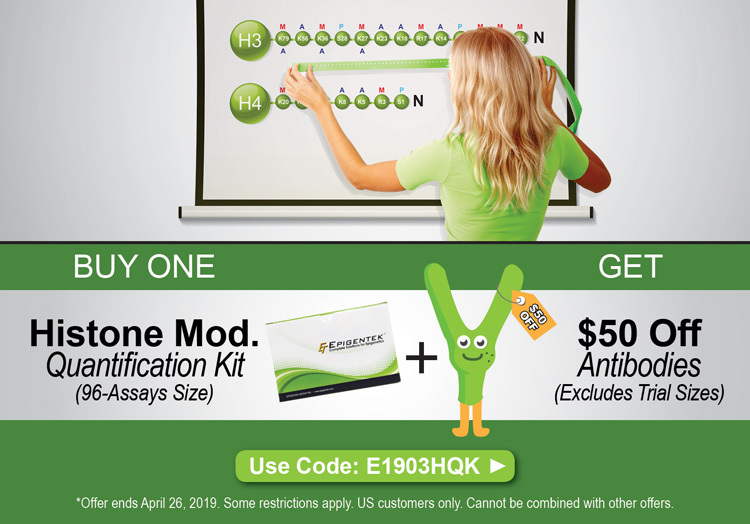 The code applies with the purchase of a large size (96-assays-size) histone modification quantification kit (histone modification specific quantification or multiplex assays) and any regular size antibody. The $50 discount excludes trial size antibodies which include sizes: 20ug, 20ul, 10ug, 10ul. One $50 discount per order. Ends 04/26/2019. Offer ends April 26, 2019.